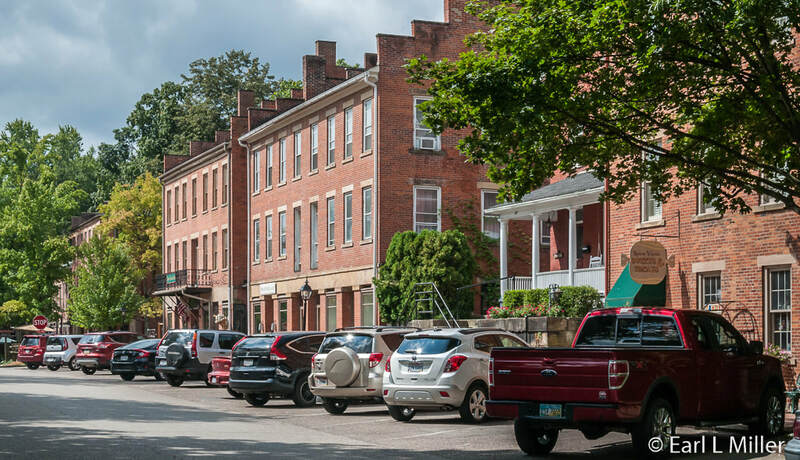 While a day long adventure visiting Roscoe Village near Coshocton, Ohio is like stepping back into a restored canal town of the 1830's, it’s also like visiting a living community of today. Numerous private residences, a dozen charming boutiques, exhibit buildings, and a variety of fine dining establishments stand side by side. Adding to the beauty are multiple pocket and heritage gardens. The problem is not what to do at Roscoe Village but finding time to do it all. 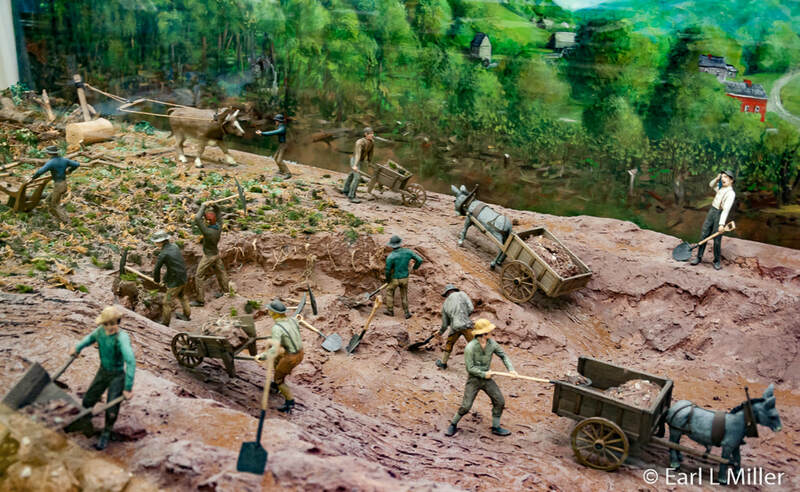 The visitor center has displays on the canal era, a theater, and the opportunity to make your own crafts. 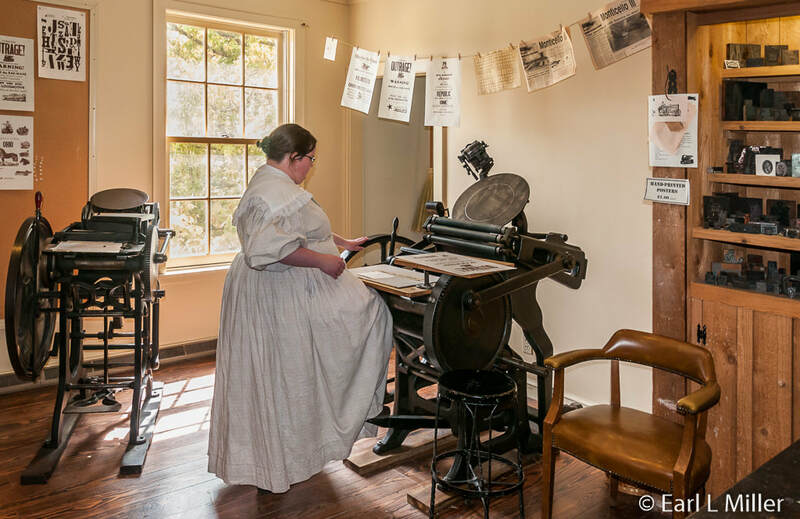 Exhibit buildings contain costumed craftsmen and villagers anxious to demonstrate the 1800's skills of living and working in the town. 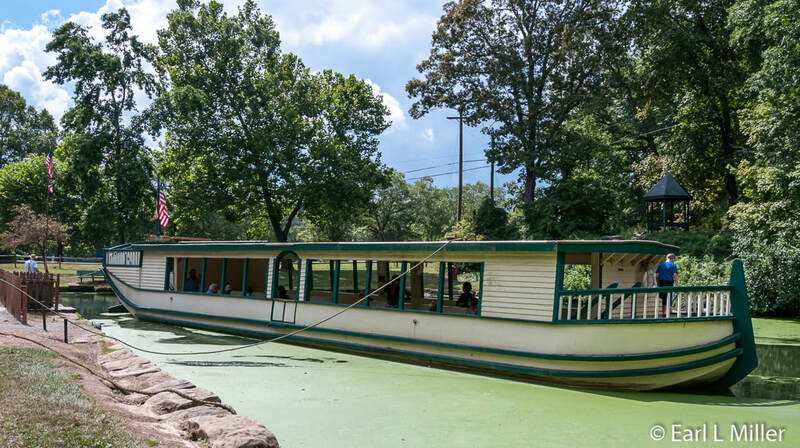 A relaxing 45-minute canal packet ride on the Monticello III awaits visitors while the Johnson-Humrickhouse Museum is known for several collections. The Deerfield Village Massacre occurred in Massachusetts in 1704 during the French and Indian War. At that event, Mary Harris, later known as the White Woman, was among 112 English captives marched 300 miles to Montreal by 200 Indians and about 40 French soldiers. Harris was a 10-year-old servant girl who had married a Mohawk brave. 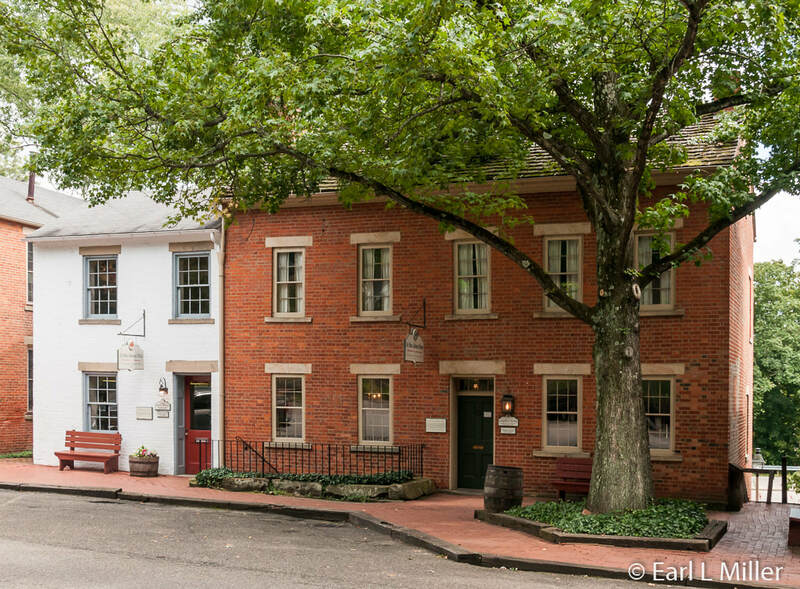 In 1816, Roscoe Village was laid out due to a bankrupt merchant believing farmers would rather do business in his town than pay a $.25 toll for to take the ferryboat to Coshocton. James Calder set up his shop and called the spot Caldersburgh. The town was renamed Roscoe Village in 1830 in honor of William Roscoe, a leading abolitionist and English historian. 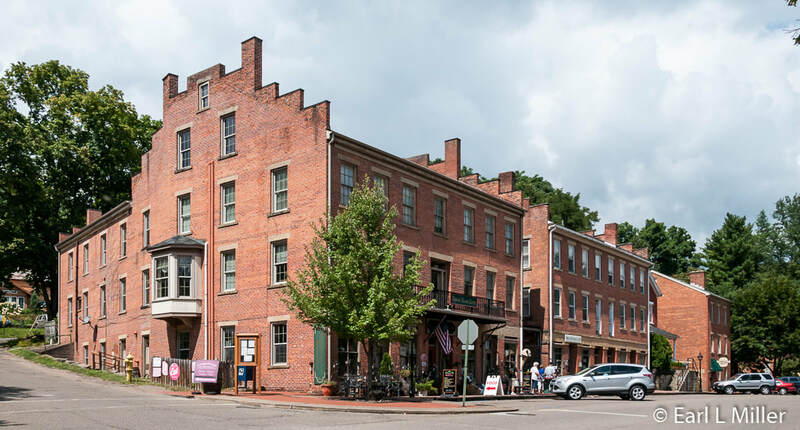 Similar to many small towns along the Ohio & Erie Canal, Roscoe Village boomed with a new prosperity as it became the fourth largest wheat port on the canal system. Its first canal boat, the Monticello, arrived from Cleveland at Roscoe on August 21, 1830. Arnold Medberry was the active force behind the village. He owned a sawmill, flour mill, wood planing mill, a hotel, and other interests. Today his Empire Mill, at the Triple Locks, on the west end of the Lower Roscoe Basin, consists of stone structures that are modern day ruins. The village also had a set of double locks, Locks 26 and 27. They are seen today on the trail between Roscoe Village and the Monticello III canal boat landing in Coshocton Lake Park. Medberry made his final trip to New York in 1861 aboard a canal boat. After his holdings were auctioned off, on the eve of the Civil War, his estate was left in financial ruin. He died soon afterwards, but his wife was able to raise enough money to save his honor. The village thrived until the 1860s when the railroads became the dominant form of transportation. After a series of fires due to arson, the Great Flood of 1913 finally swept it away. In 1910, Coshocton Power started receiving hydroelectric power from the Ohio & Erie Canal. In 1957, the canal was still being used but limited to night power. In 1961, Coshocton celebrated its Centennial. An artist, Dean Cornwell, was hired to capture the town’s history in a painting. That is when he spotted Roscoe Ruins. He visualized it as a thriving canal town, not the squalor it had become, and created a mural in Bank One of Coshocton. The same mural, albeit a smaller version, graces Roscoe Village Visitor Center’s main wall. Industrialist Edward Montgomery, who innovated the use of latex over fabric gloves, and his wife, Frances, admired the mural and decided to revitalize Roscoe Village to its peak condition. Their idea was enhanced by a recent trip they had taken to Williamsburg, Virginia. In 1968, their first project was the Toll House. The Toll House was where the village’s first recorded toll collector lived in 1840. Today, visitors can watch, on the main floor, interactive videos sharing the restoration history of any building in the Village. They can buy tickets for the historic buildings and purchase crafted items for sale. On weekends, they can go downstairs to see a vast collection of more than 400 vintage toys from American manufacturers dating from the 1860s to the 1960s. Many were made in Ohio. 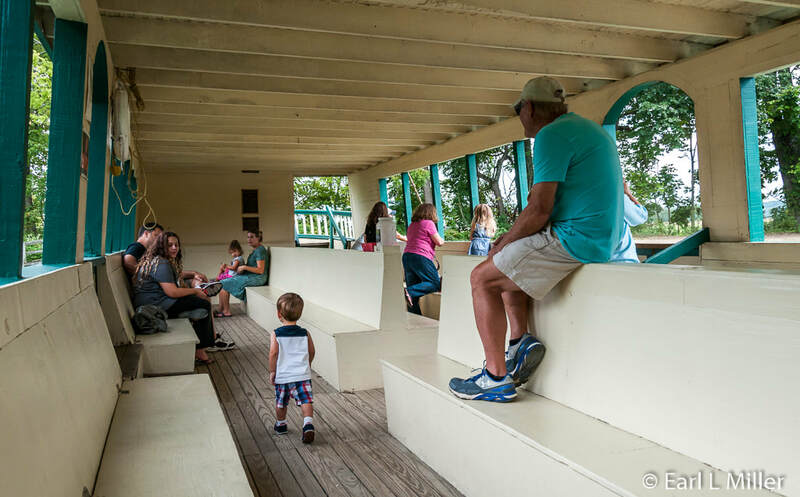 Richard Hoover, a storyteller, is there to demonstrate these most weekends from 1:00 to 3:30 p.m. April through mid October and at candelightings in December. Admission is free. Frances Montgomery planted a garden at the Toll House and assisted with most of the tiny gardens seen today. To honor her, the Visitor Center has a grand garden titled Frances B. Montgomery Memorial Garden. It incorporates some of her favorite features such as placing stones into the landscape and planting favorite trees and blossoms. This garden has become a popular wedding site. The Montgomerys tackled the Warehouse, 400 N. Whitewoman Street, the same year as the Toll House. Arnold Medberry had built this warehouse and mill store in 1838. Today’s diners find Lock 27 Pub and the Steak N Stein Restaurant here. During the summer, a patio is equipped with an outdoor oven/grill, plenty of seating, and a stage. Dining is available at lunch and during evenings. In 1856, Medberry also built the Roscoe Hotel at 403 Whitewoman Street to replace the wood-framed hotel that had burned in 1832. It was a stagecoach stop as well as one believed to be on the Underground Railroad. The hotel had businesses on the first floor, sleeping rooms above, and a ballroom on the third floor. Located at the Roscoe Hotel’s rear, Medberry Café at 403 Whitewoman Street provides a place for lunch or a snack. At the same address, Medberry Marketplace offers deli and international foods, bulk snacks, chocolates, kitchen items, and more. Uncorked at 365 N. Whitewoman Street now occupies the William Roscoe Building circa 1840. It was a one time mortuary and general store during Canal Days. Today’s visitors find a full line of gourmet coffees, a full service wine bar, sandwiches, and weekend entertainment. Its adjoining retail shop sells more than 200 imported and Ohio wines. Today the Montgomery Foundation and the Roscoe Village Foundation continue to link the Canal Era to the present. 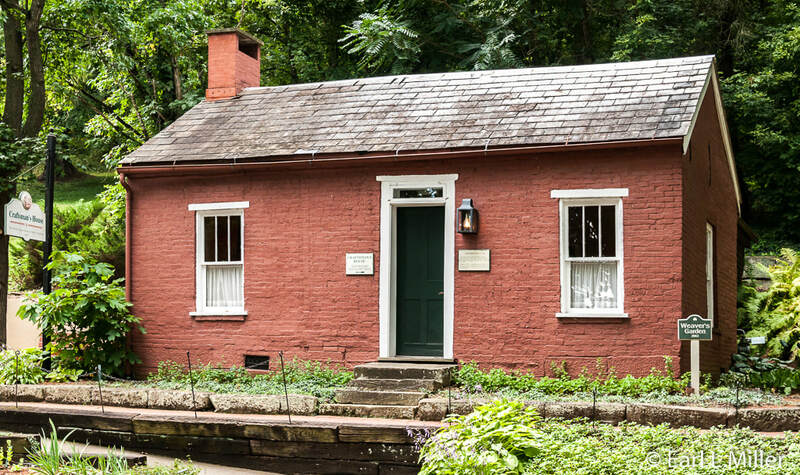 The effort is to preserve, protect, and promote a vital piece of history along the banks of the Ohio & Erie Canal. The Visitor Center should be your first stop. It’s “Ditches of Destiny” video provides an excellent orientation to all aspects of the Ohio & Erie Canal. It is shown upon demand for a nominal fee with self guided tours or just before the scheduled historical tours. At the Center, visitors can also purchase craft items and tour the Founders’ Gallery to learn the Montgomery story. 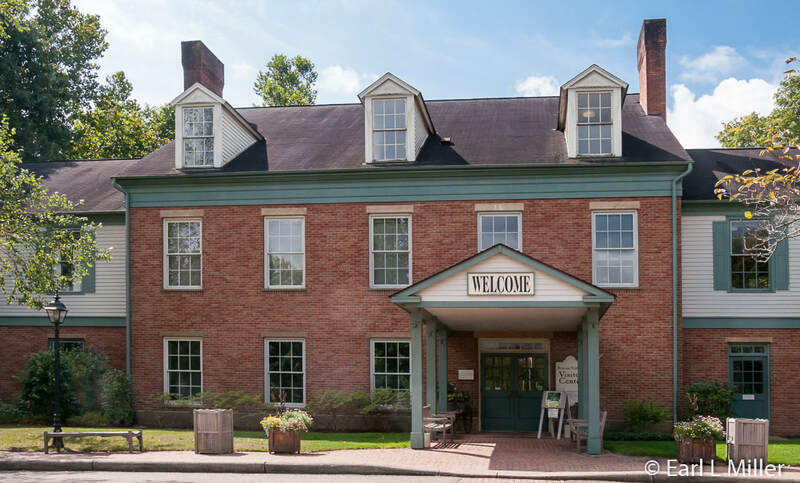 You’ll also want to explore the many exhibits here ranging from Mary Harris and the French and Indian War to Coshocton’s and Roscoe Village’s early history. Find out how the canals were dug and locks constructed, how boats traversed canal locks, about the tolls their owners paid, and the poor labor conditions. The horrible living conditions ranged from becoming ill with malaria and cholera, sleeping on dirt covered floors or straw mats, to often eating wild game. 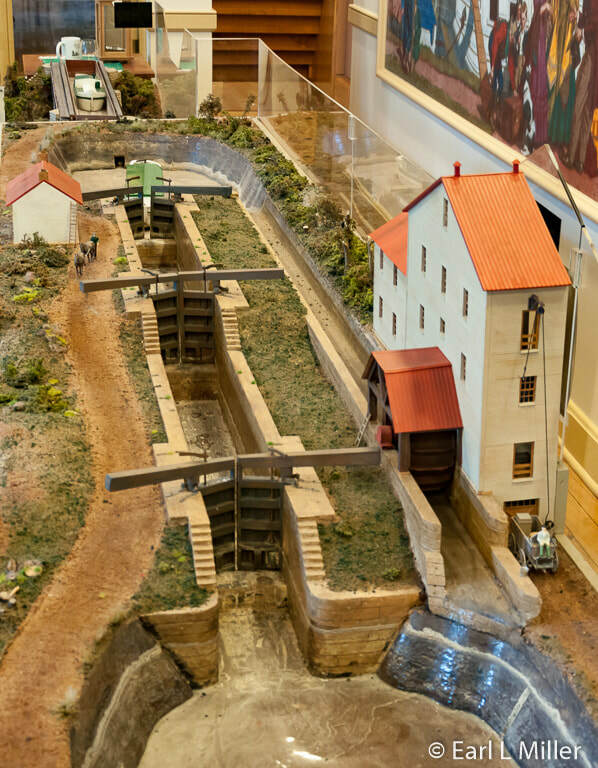 One large map depicts the paths of the different canals while a working model of a grist mill reveals its operations. Tolls were determined on freight boats by the kind and weight of the freight. On passenger packets, the number of passengers on board decided the fee. Children and adults enjoy making a wide variety of crafts at the visitors center. They can transform a piece of tin into a decorative ornament, dip candle wicks into warm wax to form a small pair of candles, or weave a small two inch square. They can also learn to twist rope from jute twine, decorate a wooden top, and design a quilt square. The charge for participating is $3 and 20 to 30 minutes should be allowed per craft. To learn more, including the suggested age group, go to their web site page at their activities web page. The type of tour you receive depends on what month you visit Roscoe Village. Almost all buildings, even the shops and restaurants have signs, so it is easy to find what you are seeking. A tour leader departs on guided tours from the visitor center. On these, no costumed guides are usually found at the historic buildings. These take place in April and May as well as September through December at 1:00 p.m. daily. The Toll House is open from 10:00 a.m. to 4:00 p.m. daily. 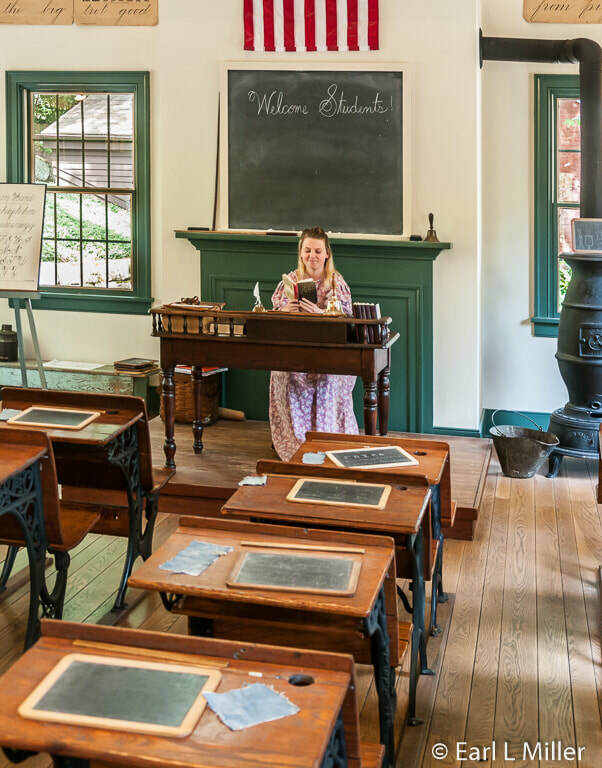 From Memorial Day through Labor Day, costumed villagers who demonstrate crafts and explain village lifestyles can be visited at the various buildings from 10:00 A.M. to 4:00 p.m. daily. The Toll House is also open during these hours. Your tour is self guided. From January through March, no tours are provided, and the Toll House is closed. However, the visitor center is open daily from 10:00 a.m. to 4:00 p.m.
Roscoe Village’s Visitor Center is located at 600 N Whitewoman Street. Costs of the tours, whether self guided or led, are adults $10.95, seniors (60+) $9.95, students (K-12 and college with current ID) are $4.95; and five years and younger are free. Family tickets are available for $29.95 for two adults and two children for ages 6-18. Tickets can be purchased at the Toll House and visitor center. The telephone number is (740) 622-7644. 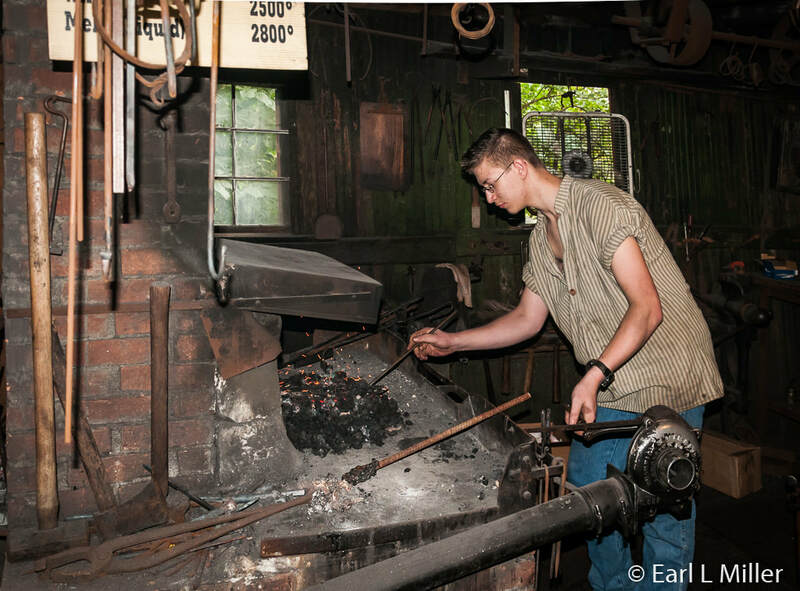 The most famous of the Roscoe Blacksmiths was Cleon “Tinker” Dobson, who was born in 1889 and died in 1976. The Montgomerys enjoyed talking to him as he knew a lot of canal lore. They were known for bringing their pony to be shoed who did not appreciate the effort. The pony and Tinker hated each other and the air was blue with swearing at shoeing time. The present blacksmith shop, built in 1889, was a stable in the 1990's. It was where Dobson worked. His home was next door. It was renovated in 1978. At this location, we watched Thomas Stonebraker demonstrate making door hangers. Built in 1987, the Center honors Raymond Hay, a community leader and active supporter of Roscoe Village. 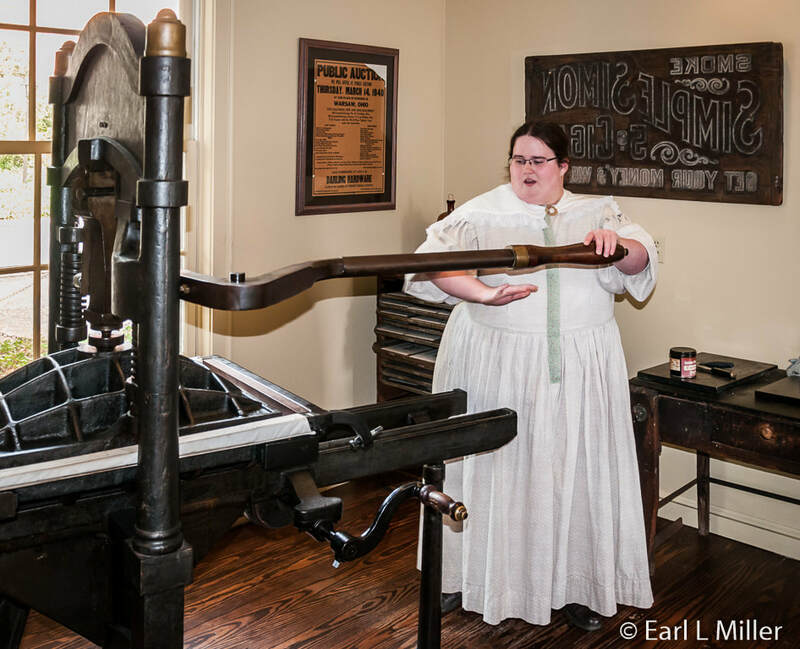 In one area, we watched our guide, Lasha, who is Roscoe Village’s print master, operate a 1870s Kelsey self-inking press and help Earl print his own bookmark. We learned all type is set in one font and one size using a composing stick to build a line. She showed us presses from the 1880's and 1899. Lasha advised us that Roscoe Village does not do custom orders. 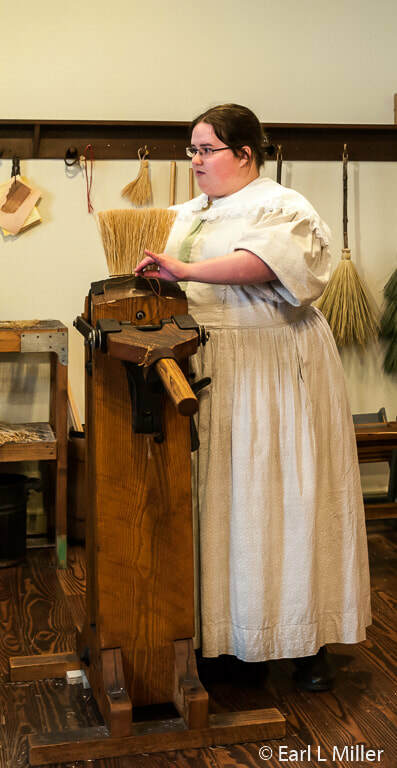 At the other section of the Center, broom squire, Stacie Stein, demonstrated to us how brooms are made from broom corn and showed the present and past kinds of brooms. Stacie is the Head of Education for Roscoe Village. She has served as the blacksmith, weaver, candle marker, and potter which are other Roscoe Village crafts. We learned broom making was a cottage industry as there were no factories supplying this skill. Most likely, local farmers grew broom corn and spent time during the winter fashioning brooms. After broom corn is soaked, it’s tucked under the wire used to tie it together by a broom winder. The wire wraps around the broom corn then is dried and stitched by hand. Ends are cut off as if going through a giant paper cutter. Extra materials can be saved to make small brooms. The smallest pieces are used for kindling. Brooms, ranging from whisk to floor, are sold at the visitor center and the Toll House. Roscoe Village’s have leather and nylon straps. ​We learned that the Besom broom was used by pre history cultures around the world. It was not effective since its shape was too stiff and it broke too easily. The flat broom, in use since 1830 by Shakers, is the type made today. 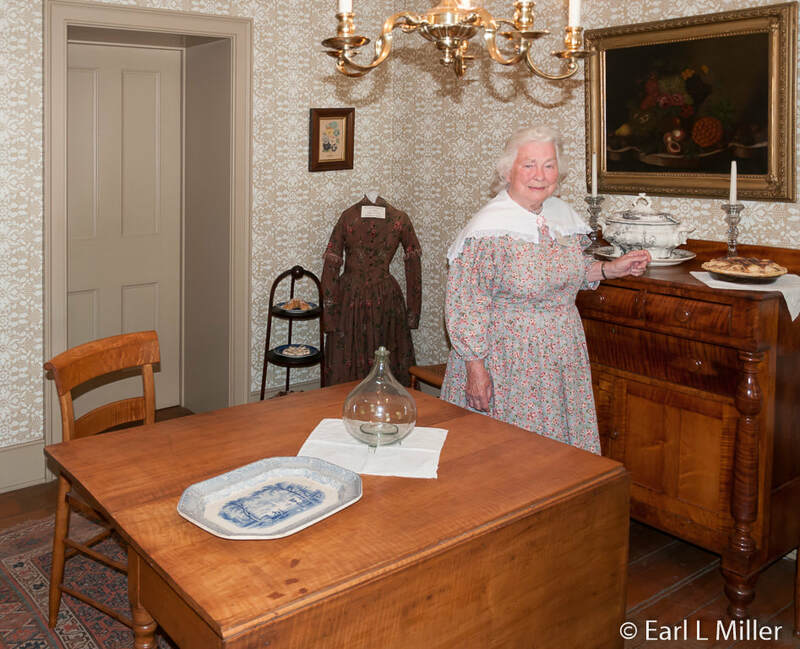 While most of the furnishings are period rather than original to the family, you can imagine Dr. Maro Johnson, his wife Eliza, and their four children, living in the 1833s home. Its porches were enclosed in 1841. Our guide, Betty Lou Fee, explained the various rooms. The parlor has the original ash wood floors. In this room, you’ll spot Eliza’s shawl, given to her as a wedding present, the English tea set with no handles, and the home's original fireplace. Above the mantle is Dr. Johnson’s only remaining photograph. 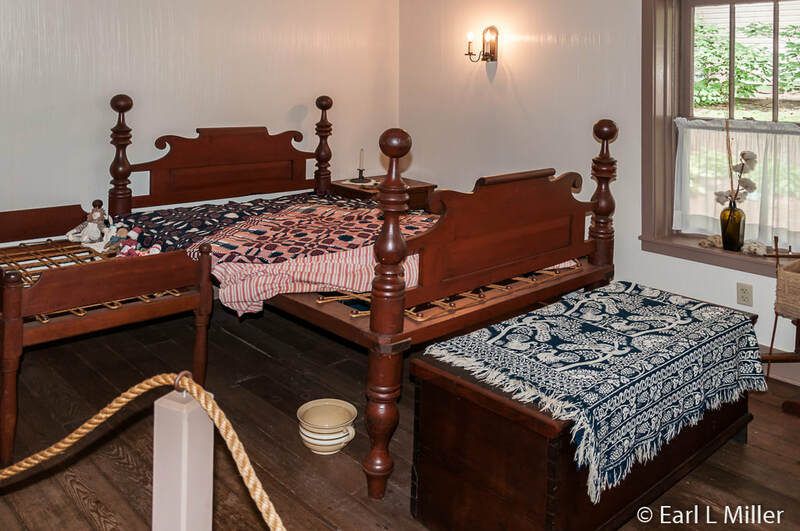 The furniture in the company room was made in Coshocton in 1830. It was common for the girls to play parlor games here. The boys liked to watch canal activity. In 1968, Roscoe Village started the home’s restoration. A historian from Williamsburg picked out the style and color that the doctor might have selected as wallpaper in this room. Visitors can go downstairs to visit the kitchen and pantry. Most of the family’s meals were eaten there. The entrance is at the back of the house. Roscoe Village normally stations two people in the house - one on the main floor and one in the kitchen. 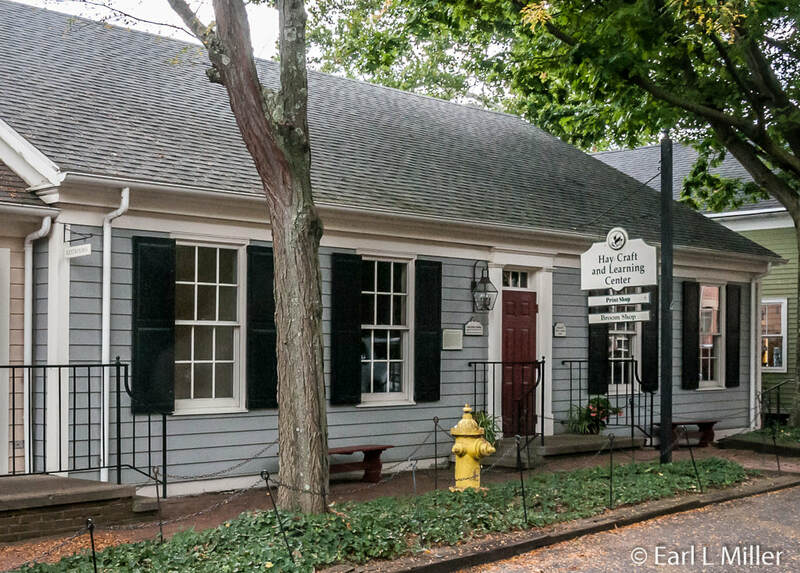 Next door is Dr. Johnson’s office constructed in 1842. Visible are such tools as his old scarificator for bleeding people, his stethoscope, and the drugs he might have used. Being a country doctor, he bartered for his services instead of receiving regular payment. Jason, our guide in this building, provided stories about 1800s medicine. Across the street, we met Shania Caley, who plays the role of school marm. 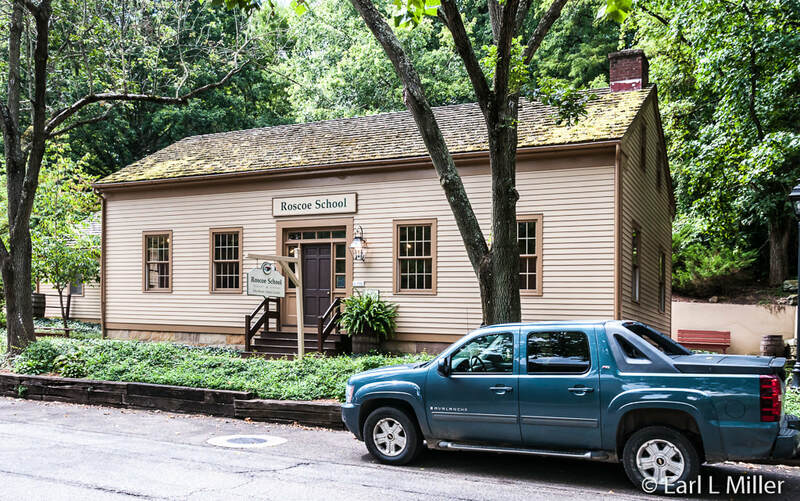 The original Roscoe Village school had one room. It was torn down in the 1850's to make room for a two-story brick structure which burnt down in 1911. On display are a teacher’s desk and multiple wood and iron-made school desks. Off to Shania’s side was a wood burning stove. Music was important for these students. On view is a 1872 Steinway piano and 1890 Miller organ. Toys that today’s youngsters can play with are available ranging from checkers, spinning tops, wooden puzzles, and a whirl-a-gig. Youngsters can practice reading, writing, and arithmetic. Instead of chalk, they’ll use soapstone. Staff also encourages children to use the school’s stage. 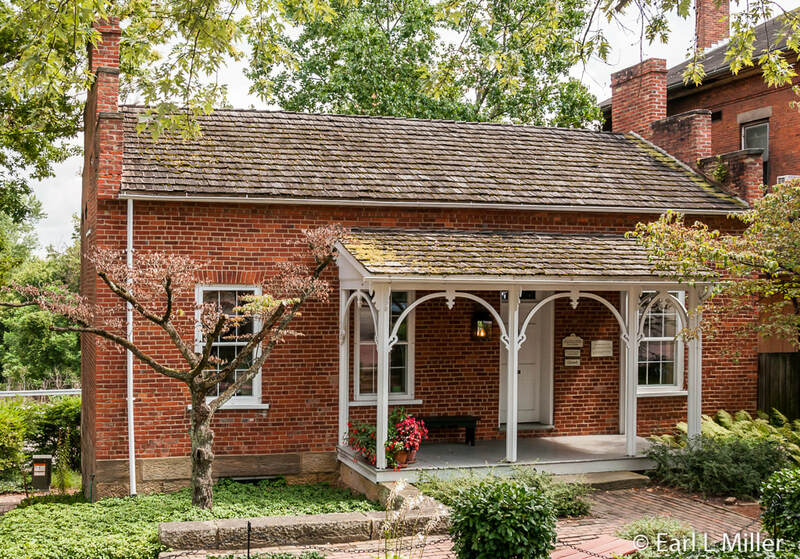 Built in 1825, the Craftsman’s House is the oldest one in Roscoe Village and the only one moved from its original site on SR 541. It was previously the home of weaver, Daniel Boyd, his wife Jane, and their children between 1825-1835. You can view the rooms where they lived. In the bedroom, we spotted two of the last coverlets Boyd had made between 1825-1850. 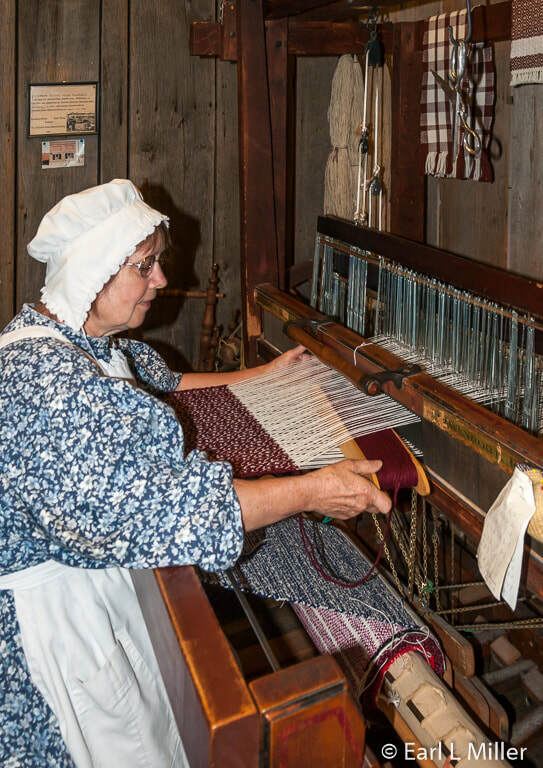 Weavers were valued community members as coverlets were needed for beds and cloth was essential to make clothing. Unfortunately, the canal was not a blessing for him since handmade goods were replaced by factory produced coverlets and clothing. Boyd sold the house in 1835 to the Methodists for their parsonage. He then moved to Keene, Ohio where he was a merchant and finally lived in Athens, Ohio. In the back room, Seneth Darr demonstrated her weaving as she provided information about the various looms. She explained the process on one dated 1908. On the other side stood the largest loom dated two hundred years old. As you stroll the village’s brick streets, you’ll come across an array of fascinating shops that will satisfy a wide variety of shopping desires. All are housed in beautifully restored 19th century buildings adding historical touches to what you are seeing. Hours and days for each shop are posted on the Roscoe Village web site. We made our first stop Annin Flagmakers Showroom and Tourism Information at 432 N. Whitewoman Street. Between 1850 and 1860, it was a grocery store before becoming a private two story home. One fascinating photo here is of Mad Marshall Jacobs who was married on top of a flagpole. He had spent 120 days there and insisted his wife come on top. The event was covered in Life magazine. Jacobs restored the first canal boat in the early 1970's for tourists. 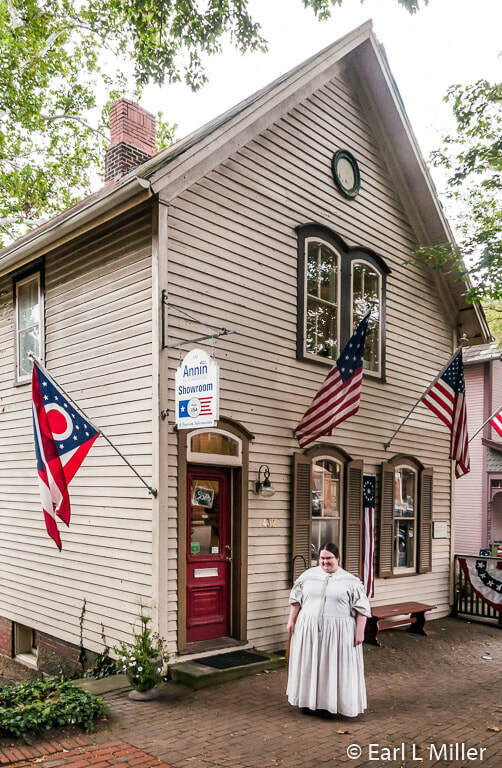 The store is the location of the Coshocton Convention & Visitor Bureau, it’s an ideal place to pick up brochures and learn more information about the area. It’s also the Annin Flagmakers showroom. You can purchase American flags, locally made in Coshocton, at the oldest and largest flag manufacturer in the United States. Nicholas Schott, a miller by trade, immigrated to Coshocton in 1838. A duplicate of his home, where Canal Cargo is now, was erected in 1974 since the former Schott home was beyond restoration. Today it’s a gift shop selling everything from Vera Bradley handbags to Yankee candles, clothing, body care items, and more. It’s located at 442 N. Whitewoman Street. Abigail Birch & Company at 416 N. Whitewoman Street is the only wood-framed, double family structure on this street. At one time, it housed a tavern which had burned. In 1892, E. C. Gleason who owned the lumber mill purchased it. It’s known for its coffees, women’s scarves and accessories, Christmas items, and canvas prints. Housed in the 1850 Thomas Wilson building, shoppers find The Cottage Gate. Its specialty is Cottage-style accessories whether they are furniture, tapestries, wall art, throws, and more. 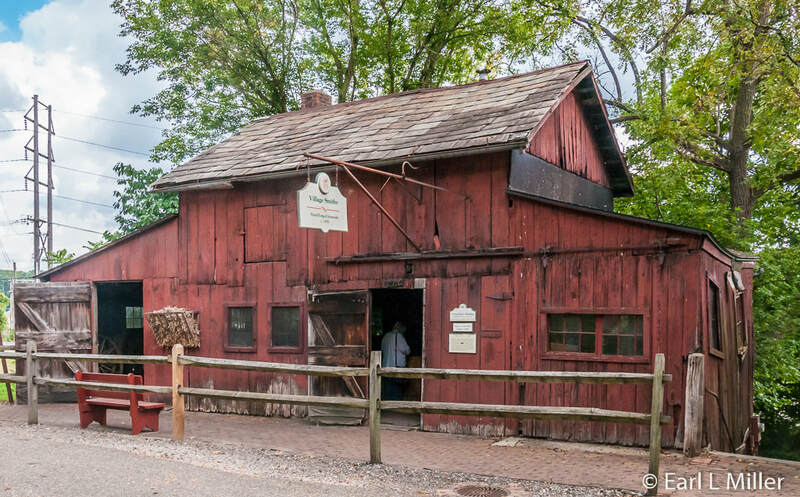 Wilson in 1850 was the owner of a carding mill, salt house, and cooper shop (barrels) along the lower canal basin. The building's two structures became one in 1887. At 322 Whiteman Street, the place for jewelry in town is House of G. A. Fisher Jewelers. It is a third generation business that sells and repairs pieces. It occupies the 1838 home of the Compton family. Compton was a teacher, an attorney, and served as mayor of Coshocton for two terms, 1872 and 1874. Kiefer’s Florist is found at 381 Hill Street. Since 1913, the company has provided flowers, green plants including seasonals, and home and garden accessories. Located nearby at 398 Hill Street is Knob Hill Design where shoppers find American Bench-made furniture, antiques, glassware, aprons, and pillows. Ohio State of Mind features all Ohio-made products. It’s located at 318 North Whitewoman Street. Built as the Jackson Township Hall, it still serves that function. It was the site of the volunteer fire department in the 1960's. It was restored in 1973. Lasha, our guide, strongly recommended River Ridge Leather in the James LeRetilley Building. Here shoppers can purchase quality handcrafted items which the owner himself makes using traditional tools and techniques. James LeRetilley moved to Caldersburgh (later Roscoe Village) in 1825 to open a general store with William Wood. LeRetilley was appointed the town’s first postmaster on August 2, 1826. He purchased the 1847 building in 1948 and died in 1850. It’s located at 355 N. Whitewoman Street. Roscoe General Store, 348 N. Whitewoman Street, is found at the John Barkhurst Building. At the same site, shoppers discover on the lower level many Christmas decorative items. Built by Barkhurst in 1870, the building was a drugstore and general store. It was restored by the Montgomerys in 1971. Located behind the general store is Good Boy Bakery, Roscoe Village’s newest store. This one is for dog lovers with specialized treats, wellness products, and general care items with only natural ingredients. They also carry all the dog supplies you will ever want. Shoppers’ sweet tooths will be served at Roscoe Village Sweets & Treats at 435 N. Whitewoman Street. It offers over a thousand different chocolates and candies. Housed in the 1846 John Dredge Building, the structure has an extensive history. Dredge, who had a chair factory in the village and made furniture, bought and sold the building to Christopher Miller that year. 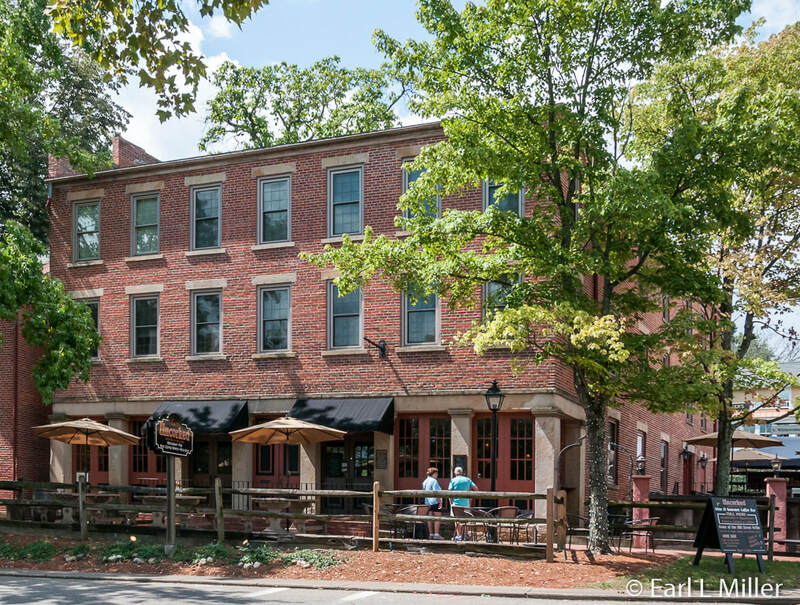 When Miller died in 1847, ownership transferred to James C. Harrison who, at this location in 1856, opened the Harrison Tin Shop and Hardware Store. The Lock Keeper’s house has been home to Wildwood Music at 672 N. Whitewoman Street for 35 years. The store is known for their hand-crafted acoustic guitars. One of the few original buildings still standing in the town’s lower basin, the building was the 1870 home of Thomas and Millie Wilson. It was constructed at the same time as his woolen mill. 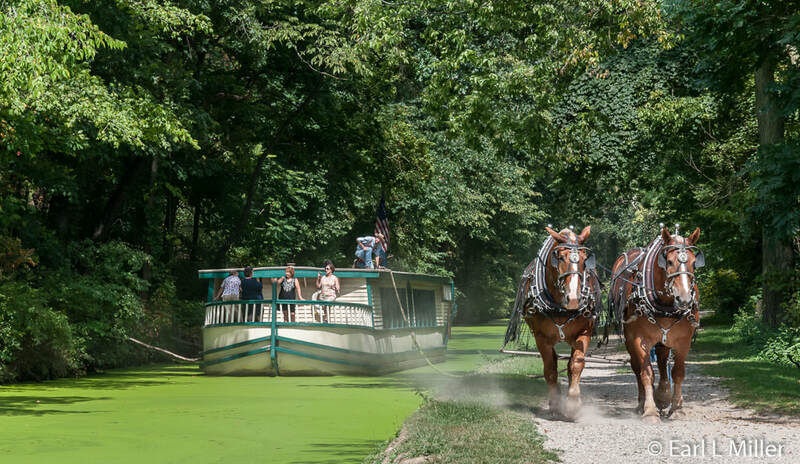 You may want to conclude your day with a restful 45-minute, 2-1/2 mile round trip on Monticello III Canal Boat. It’s pulled by a team of Belgian horses, Matt and King, led by a hoggie on the towpath along the canal. Between Memorial Day and Labor Day, it runs from Tuesday through Friday at 1:00, 2:00, and 3:00 p.m. and on weekends with an additional time at 4:00 p.m. Between Labor Day and October 21 in 2017, it traveled only on Saturdays and Sundays during the four weekend times. Admissions are $8 for adults, $7 for seniors, $6 for students, and free for those ages five and under. We found the trip narrated during the first half. We were told to be on the lookout for wildlife. Large turtles, snakes, beavers, raccoons, muskrats, and groundhogs can be found near the canal. Earlier this summer, a deer made its appearance. Our captain, Ed Finlay, told us about life on the canal, its construction, its economic consequences, and its decline. 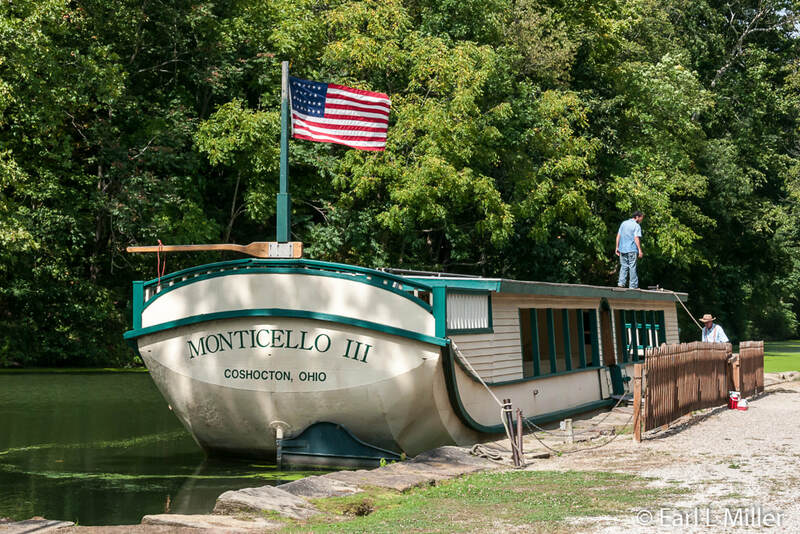 He informed us that the Monticello III was made in Indiana in 1990 and has a stainless steel hull. It has a length of 74 feet, width of 142 feet, and weight of 25 tons. It’s a large replica of what was used originally. The boat is owned by the park district. This museum within Roscoe Village is devoted to five galleries: Native American, Historic Ohio, Asian (Japanese and Chinese), 19th and 20th Century Decorative Arts, and a temporary changing gallery. The collection houses more than 17,000 items and is accredited by the American Association of Museums. It is said to be the legacy of John and David Johnson, two Coshocton brothers who grew up in the mid 19th century. They traveled the world collecting regional and cultural artifacts from the various locales they visited. The museum opened to the public on May 8, 1931. The museum is nationally known for its collection of American Indian baskets. 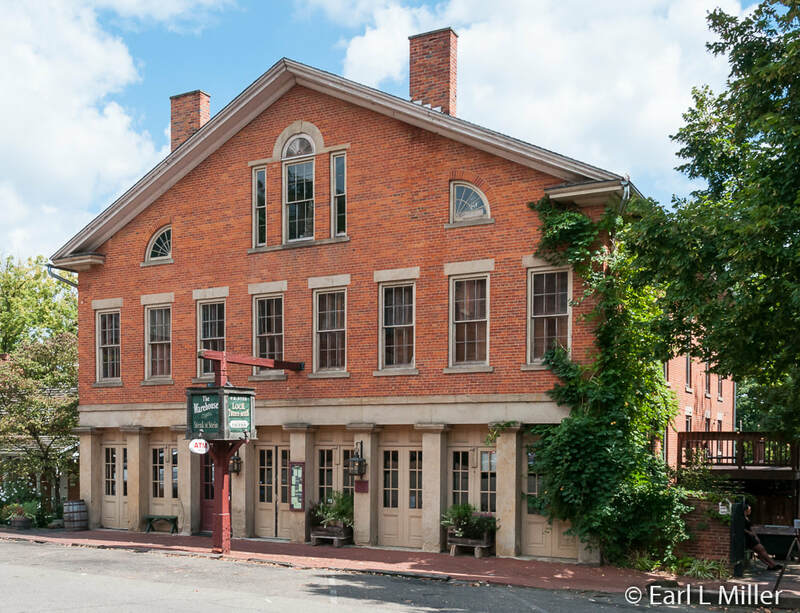 A highlight of the Historic Ohio section is the showcase of various 18th century longrifles. The most noted pieces are the Newark Holy Stones composed of four objects: the Keystone, the Decalogue Stone, a two-piece box made to house the Decalogue Stone, and a bowl. The Keystone and Decalogue Stone are inscribed in Hebrew and the Decalogue Stone bears an image of Moses. These were uncovered in the 1860s near Newark, Ohio and may be tied to the Hopewell Indian culture (100 B.C. to 500 A.D.) However the question remains - where did they come from? It is located at 300 N. Whitewoman Street and the telephone number is (740) 622-8710. It is open May through October noon to 5:00 p.m. daily and from November through April 1:00 to 4:30 p.m. Tuesday through Sunday. Admissions are adults $4 and children (ages 7-18) $3. A family rate is available. While special events occur throughout the year, two big ones are the Apple Butter Stirrin’ Festival in October and the Christmas Candlelightings in December. The Apple Butter Stirrin’ Festival hosts over 100 artisans and crafters as fresh apple butter simmers open an open fire. A variety of music, contests, and vendors are offered as well as various educational outdoor demonstrations. Christmas Candlelightings results in the lighting of the Christmas tree and your own candle as everyone sings “Silent Night." Horse drawn carriage rides are available.